Vintage style pocket watches and compasses. Hunter and Half Hunter pocket watches and a variety of retro and unusual compasses. 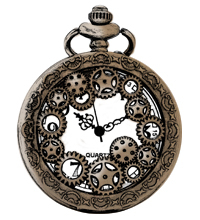 If you'd like to find out about the history of pocket watches and the different types available, take a look at our pocket watches blog post. We offer Free UK shipping for all items.